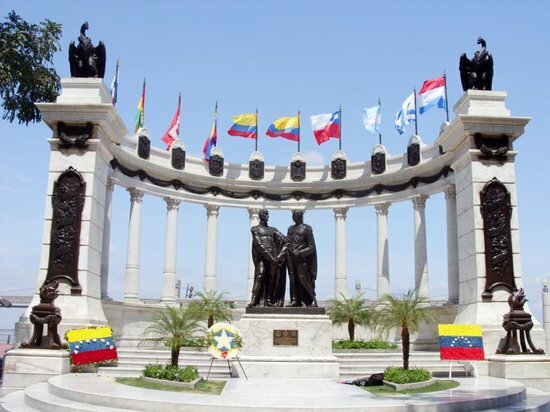 Guayas (Spanish pronunciation: [ˈɡwa.ʝas]) is a coastal province in Ecuador. It is bordered to the west by Manabí, Santa Elena, and the Pacific Ocean (as the Gulf of Guayaquil); to the east by Los Ríos, Bolívar, Chimborazo, Cañar, and Azuay; to the north by Los Ríos and Bolívar; and to the south by El Oro and the Pacific Ocean. Founded in the 1530s, Ecuador's largest city and main port is the top access point for Galapagos cruises and home to a bustling import-export business. Tourism is on the rise as well, thanks to a new international airport and urban renewal projects along the River Guayas promenade and in the historic neighborhood of Las Peñas. The 465-step climb to the top of Santa Ana Hill provides sweeping views and a chance to stand on the site of the city's birthplace.